Banaue Rice Terraces — an iconic and ancient landscape of the Philippines that is said to be the greatest engineering masterpiece of the indigenous people in Ifugao: the Igorots. Towering to great heights at approximately 5,000 feet above sea level, the terraces were carved mainly by hand using stone and mud walls that follow the natural contours of the mountain. This grand feat was necessary because it was hard for the Igorots who live in these highlands to find flat and fertile land to plant crops in. Accordingly, with the presence of the terraces, it was then possible for them to cultivate rice by harvesting water from the mountaintop forests (wherein water will be trapped in each terrace pond while the excess would trickle down to the lower structures). Needless to say, the rice terraces were important to the survival of the Ifugao people; it is even strongly ingrained in their culture since the knowledge to sustain these fields have been passed on from generation to generation. This perfectly exemplifies how humans can harmonize with nature in order to come up with a sustainable agricultural system using traditional techniques. It helps to note that this is not the only rice terraces in the world; most can be found in Asia and there are even other rice terraces in the rest of the islands in the Philippines. Covers a vast area that’s over 10,300 square km – if these terraces’ steps would be put in a straight line, it would encircle half the Earth! A ‘National Cultural Treasure’ – declared by the Philippine Government under the Ifugao Rice Terraces by virtue of Presidential Decree No. 260 in 1973. It is truly a cultural treasure that up to this day, it is imprinted on the back of the Philippine twenty peso bill (₱20) denomination. (Previously, it was on the back of the 1,000 peso bill). It’s a 2,000 year old wonder – as declared by the American anthropologists, Otley Beyer and Rey Burton. Be that as it may, there’s a study in 2014 that says it might just be 400 to 500 years old. It’s not proven yet, but it’s said that it does not have much of an effect if there’s a later date because it does not diminish the heritage value of these terraces. …and come on! Just look at the photos in this post; it’s a beauty that you must absolutely see! The other rice terraces won’t certainly be as magnificent as this. Contrary to popular belief, the Banaue Rice Terraces are NOT a part of the UNESCO World Heritage Sites. They are located near the Banaue town proper, thereby making it an area that is surrounded by several modern structures. This predicament had unfortunately given Banaue Rice Terraces a low score in the criterion of UNESCO (even if in fact, it remains to have equal cultural and physical significance like the rest of the qualified Ifugao Terraces). That’s why in the end, they were not included in the five clusters that make up the Rice Terraces of the Philippine Cordilleras—which is one of the UNESCO World Heritage Sites. (Of course, in a sense, Banaue Rice Terraces could have easily been a part of the group if only the modern structures were not as plenty). What then are the five official clusters for UNESCO? Mayoyao – in the municipality of Mayoyao, it grows a rare type of rice called as ‘tinawon‘ that’s in red and white varieties. Not including #4 Hapao and #12 Mayoyao , this map shows the Municipality of Banaue. You can see here that the spot marked as #6 is where the Banaue Rice Terraces is located and that even though the #9 Batad &#11 Bangaan terraces are obviously a part of the Banaue municipality, they are NOT a part of the ‘Banaue Rice Terraces’. TRIVIA: All these Ifugao Rice Terraces used to be a ‘World Heritage in Danger’. Other than problems of deforestation and climate change, there was also the problem of globalization. It’s expected that young people of this generation would choose to move to the more urban areas of the country; as a result, there was a time when there were fewer workers on the fields and almost 30% of the terraces were abandoned or deteriorated. With all of these problems, all the Ifugao Rice Terraces were placed in the ‘World Heritage in Danger’ list in 2001. However, come 2012, they were eventually taken off from the record after national and international efforts of preservation. As for the Banaue Rice Terraces, I managed to visit this majestic sight last 2013 during our road trip to the Cordillera region, so please do enjoy the following photos! TIP: Walk around and try to go higher up the road because the view could be better from there! THE BEST TIME: June to July are the months where it is greenest (August is harvest time). Don’t go on January to March because the terraces will be barren; though actually, we arrived here in the month of December and it was almost barren; still and all, we quite liked the look of it! If you’re rather going to Batad terraces, they said that October to November is the greenest time. » How to Get to Banaue from Manila? It may be located in a northern mountainous region in Luzon (Cordillera) but there are good paved roads from Manila to Banaue. With a distance of around 350 km, it will take you approximately 7 to 9 hours – taking into account the curves and switchback roads in the mountain. Ssimply take NLEx from Manila, exiting to SCTEx, taking TPLEx exit to Pura, right to Guimba – Nueva Ecija, towards Baloc then Maharlika, turn to San Jose – Nueva Ecija, and then all the way to Nueva Vizcaya up to Ifugao. We traveled to Banaue with a rented car and err… it took us around 16 hours to reach our destination! Yes, 16 hours! It’s absurd, I know! You see, as with most rental services, problems are bound to happen. For our particular case, our headlights suddenly didn’t work. Ouch, I know. Want to know what happened? Banaue has no airport; thus, this is not a viable option. You can try to book a flight to the nearest airport which is Cauayan; however, after arrival, you would still need to take a 3-hour bus/van ride south to Bagabag and then another 3-hour bus/jeep ride to Banaue. If for some amazing reason you have your own aircraft (well, hello you!) Bagabag has a private airport for fixed-wing aircraft and there’s even a helipad at Banaue Hotel. » How to Get Around? There are ample jeepneys and tricycles available in Banaue. If for instance, you want to get out of the Municipality of Banaue to go to Batad, you would have to go to the Banaue Public Market to catch the 2PM jeep that will take you to the ‘Batad Saddle’ point (it’s priced at Php 50.00 or $1+ for tourists; there’s a chance that they would try to ask you for more so beware!). To return to Banaue, the jeep from Batad Saddle only departs at 9AM; obviously, if you’re staying in Banaue, this would mean that you will have to spend the night in Batad. If that’s not your plan, you can try to trek to the Batad Junction (3 km away) to catch a tricycle or jeepney to Banaue. To avoid all this trouble, you can opt to rent a jeep/van/tricycle; however, be prepared for the price since it could be quite expensive. (I’ve read that some people paid Php 500.00 or $11+ for a tricycle). » What Else to Do and See? 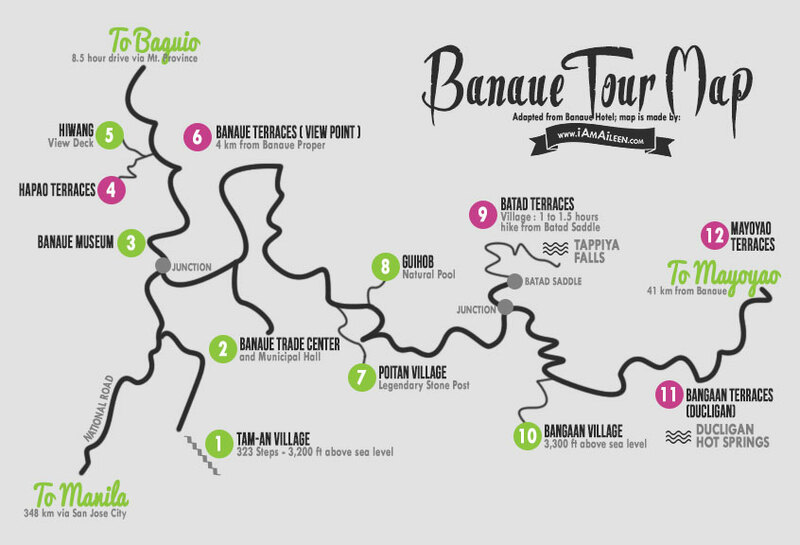 Simply check the map that I posted above and you’ll see the ’12 things to do‘ while you’re in the Municipality of Banaue. Other than the pointers on the map, there’s not a lot of other things that you can do in the Banaue town proper; it’s a rural place here and tourism isn’t that strong. In a way, it’s best to lower your expectations. But if I can add a tip… just walk around! This was how we spent the rest of our trip after we got to see the Banaue view point and it was quite an experience! It was great to meet some of the locals and there were even some kids who were willing to play with us (if not stare at us, since I was travelling with my best friend Jonas, and his cousin Sam from Belgium, haha!) Otherwise, you can also stop by the shops to buy some wood carvings and souvenirs (common crafts of the Ifugao locals). TIP: If you want to maximize your time in this region, consider going to Sagada! Simply go to the Banaue bus terminal as there are a jeepneys, vans and mini-buses available for this trip. The jeepney ride costs about Php 250.00 ($5+) per person and it will take you 3-4 hours to reach Sagada. NOTE: If you plan to go out at night, do bring a flashlight with you since the town doesn’t have that much lighting. The only grand place that Banaue has is Banaue Hotel; even so, it’s not really that grand. It’s two-starred and it’s also already quite old (yet clean!) which is expected because it’s a rural area (definitely, don’t expect anything ‘posh’ here). Nevertheless, Banaue Hotel was fine – we stayed with them for a night: they have decent Wi-Fi (not entirely fast), they serve good food, they have a friendly staff, they have a small nice pool, and they even have cultural presentations at night. (Priced usually at Php 2,000+ or $45+ a night). If you want cheaper options, there are a lot of hostels and inns in town. Examples of the popular ones would be Banaue Hotel & Youth Hostel (a new building near Banaue Hotel) and People’s Lodge & Restaurant. The food in Banaue Hotel was already pretty decent and affordable; hence, we didn’t try other restaurants. Just the same, if you’re up for other options, try Sanafe Lodge & Restaurant or Ilob Village Inn. » Are there ATMs? Can I Use my Credit Cards? A few of the Banaue accommodations accept credit cards. For that reason, it’s best to bring cash. Besides, there are NO ATMs in town either; not even banks! That being the case: cash is key! HELPFUL NOTE: Sometimes, mobile signal is very hard to get too. Even if there’s not a huge range of activities that you can do in Banaue (other than hiking, viewing the rice terraces, visiting the Ifugao villages and museums) – I would still and always recommend this trip to anyone! Witnessing these great works of the Igorots are just too much of a precious chance to skip on! Especially if you’re a Filipino like me, I think that you would be thrilled to finally see this landscape in person. I say this because – much like me – I bet that you have been seeing photos of the Banaue Rice Terraces on diagrams, on your school books, and on your peso bills ever since you were a kid. For these reasons and more, it will naturally be an amazing affair for you to see it with your own two eyes! Would you want to visit the Banaue Rice Terraces? Or at least one of the other five UNESCO terraces? Or have you been here before? How did the trip go? This is an awesome guide post - very comprehensive and some lovely pictures to show too. We had such little time in the Philippines that we didn't make it here, but we can't wait to go back and I'll add this to the list. Sorry to hear that, but at least now, you have something to look forward to! What a great post. I would love to visit. And this post is a huge help for planning to make that happen! I've always wanted to visit rice terraces and this is a really comprehensive guide. Thanks for the share! Great post girl, I've bookmarked it!!! Thanks Blair! Glad you liked it :) Hope you get to be in Banaue soon! Veyr informative post and love the map! I have done trekking from Banaue to Batad few years ago and it is still one of my favorite tour. Love Philippines and hope to be back soon! That's great to hear! Haven't seen Batad myself, but Banaue's terraces were enough for me :) Thanks, Nina! Thanks Kim! Hope you get to start living your dream too! This is an area that I have planned to visit many times but have as yet not made it; will do soon though. Your photography is stunning btw and love the ones of the Ifugao people. There is a book by a guy who is a taxi driver in San Francisco. I think he went to this area and helped a farmer set up a bed and breakfast after bringing him on a trip to see the US. Anyway, he describes it as beautiful, as do you. Really? I would love to know what that book is! Can you send me the title? Thank you Rovie! 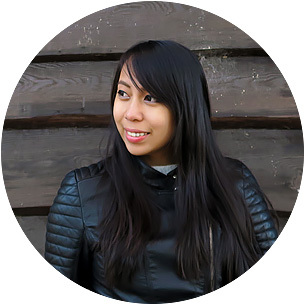 :) Glad you're back to my blog haha; and hope you also get to see this beauty! I have been to Banaue Rice Terraces a few years back. I think it was December and you are right by saying that the land was barren during that month. I plan to go back and take my daughter with me to see the stunning view when she grows up. Yeah; but in a sense, like what you can see in the photos here, the barren look is equally good as the full green ones in photos. Anyhow, I hope you get to take your daughter to see this beauty soon! That's great to hear! Hope it pushes through!